Dried oregano is a staple in any kitchen. I like dried oregano on pizza. Dried oregano is also great for marinades and sauces. Fresh oregano can be used in pesto, pasta salads, soups, and many pork dishes. For a small investment of time and dollars (seeds or plants), enough dried oregano can be produced to last the whole year. Chances are, you can produce more than enough to even give some away, create tinctures, teas or essential oils. Many traditional medicinal uses of oregano point toward its healing properties both consumed or applied as an ointment. Beyond their culinary and medicinal uses, herbs are a great addition to any garden. Many herbs can be used to strengthen the quality of a garden. Traditional gardens will use herbs to repel and attract both unwanted and desirable animals and insects. For instance, planting dill in a garden can repel aphids, squash bugs, spider mites, cabbage loopers and tomato hornworms. Chives, thyme, marjoram, mint, and parsley attract butterflies which are great pollinators. If left to flower, oregano will also attract pollinators. With many herbs, allowing them to flower in the growing season can produce unwanted results to the flavor of the herb. “Bolting” can be a big problem with some herbs. In the event the growing conditions become too hot or otherwise inhospitable, the plant can go into a reproductive overdrive and flower rapidly, or “bolt.” For herbs where flowering really impacts the flavor, this can ruin the entire harvest. Plant herbs early in the season and water thoroughly in hot weather to prevent bolting. Luckily, oregano is not typically considered one of these. However, I believe that any herb where the leaves hold the desirable flavors and fragrances will have diminished potency once the reproduction cycle has started. Plants tend to divert their energy and change their various biological systems and cycles as they grow. Many people say that oregano has its best flavor just before or as it begins to bloom. So, it is best to harvest plenty of your plants prior to flowering. Or, plant enough to allow some to flower and others you can keep trimmed. According to many sources, oregano flowers are also edible. An herb garden is a great starter garden for anyone who wants to test their green thumb. Herbs tend to be hearty and most require little care. In all actuality, like grape vines, some of the best harvests come from plants growing in less than ideal environments. A potted herb garden is a great way to use limited space to produce a bumper crop. 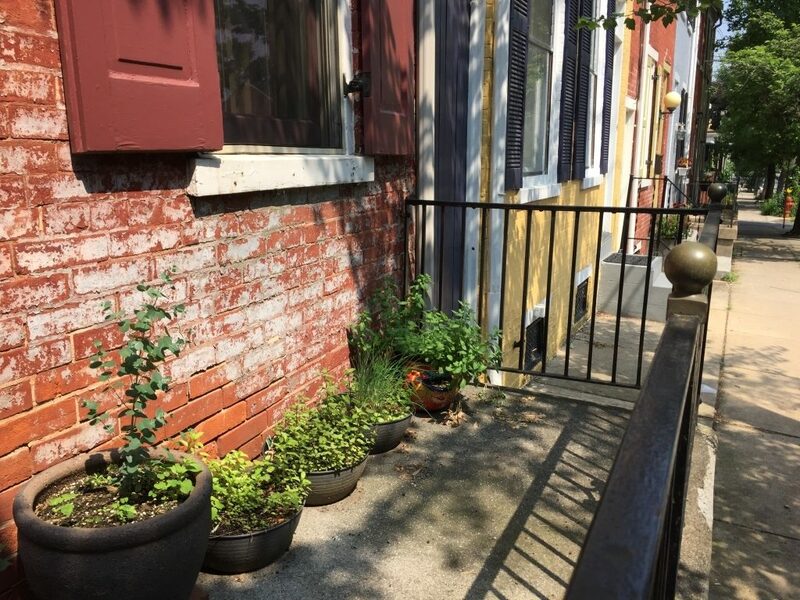 Growing herbs in the city will be fun, rewarding, and give you easy access to fresh ingredients. 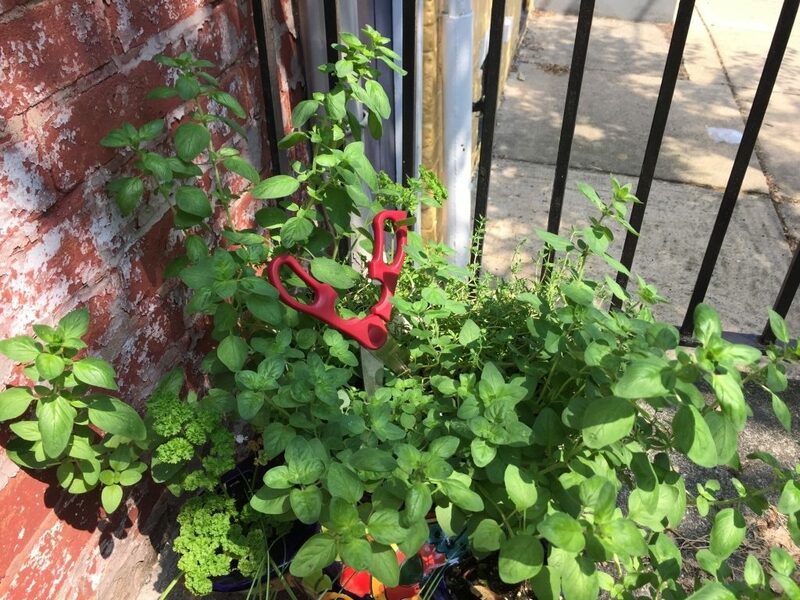 Growing herbs in the city allows anyone to have a garden and gives you access to fresh herbs! Here are some quick start options from Amazon. In this case, the oregano, although somewhat early in the season, is ready to harvest. Trimming the oregano plant early and often, to achieve uniformity in the pot, will keep the plant producing for the whole season. Trimming the plant prevents it from flowering too early and also allows you to sculpt the plant to produce the best results. Harvest or trim the oregano as needed. Try to keep the entire plant uniform and prevent it from flowering. If you grow herbs and want access to the harvest year round, you must preserve your herbs. There are many methods for preserving herbs. Some folks simply air dry herbs to preserve them. Although this may have its advantages, using a food dehydrator is one method that produces great results. 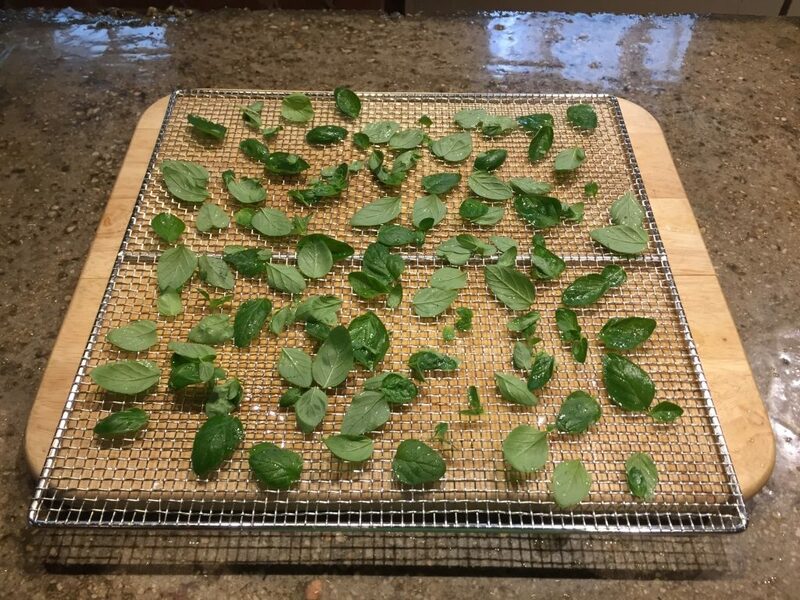 The first step to dehydrating oregano is to harvest a sufficient amount to make the time in the dehydrator worthwhile. You won’t want to harvest more than 2/3 of each oregano plant at any one time. Also, if you harvest the plant too hard (take too much), it will stunt the plant and slow down the time between harvests. Early in the season, I will only harvest 1/3 to 1/2 of the plant, normally only in an effort to trim back sprigs that have grown more rapidly than others. Later in the season, with a healthy plant, taking 2/3 of the plant is viable. In most cases, with only one or two plants, a single harvest won’t be enough to fill the dehydrator. In these cases, harvest other herbs at the same time and dehydrate them on separate racks. Running an empty dehydrator is wasteful. Harvest sprigs of oregano for dehydrating. Don’t trim more than half of each stem early in the season. This is a very good question! 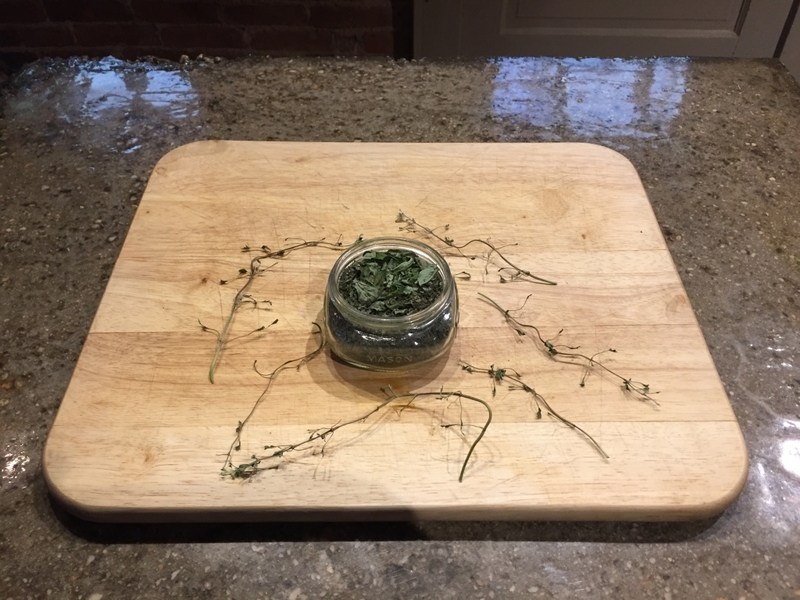 I have been drying herbs for a few seasons and have tested both methods. My advice is: “It really comes down to the herb in question.” I have grown and dehydrated a lot of dill (Hence the pickle portion of this website!). I can tell you, dehydrate dill on the stem. 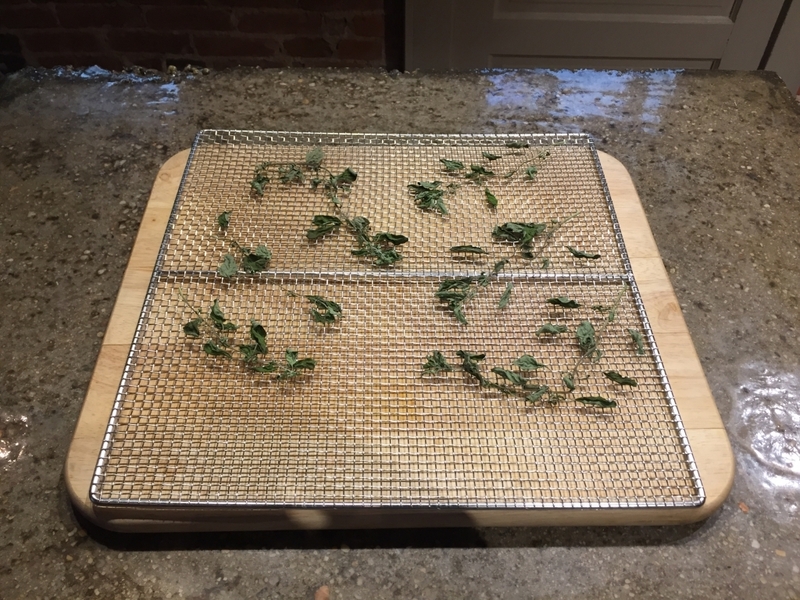 After drying, it is very easy to garble dill through the screen of the dehydrator. However, curry does not garble well through a screen, it is too sticky and it is attached to the stem too firmly. Yes, garbling. 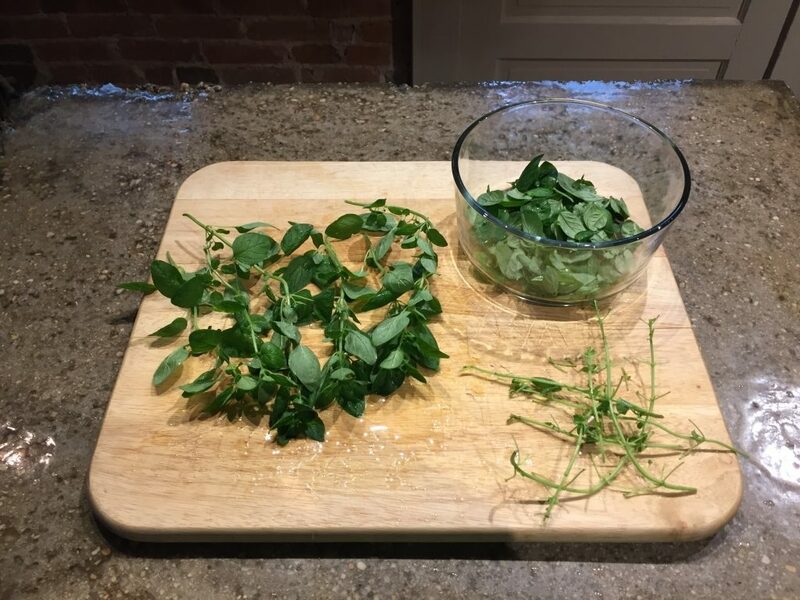 Its the process of removing the desired portions of your herbs (Often the leaves and flowers) from the unwanted portions (Often the stems and woody bits). The word may no longer be that common. Even the dictionary says: “Archaic. to take out the best of.” However, its a word that I have learned from other learned herbalists, so we are bringing it back baby! Now, I have never been told that you must garble herbs when dry. Yes, many herbs are best garbled when dry. However, as I mentioned above, some herbs make it difficult. So, if I have to pick through the herbs anyway, I think I would prefer to do it fresh. In this case, I am testing the process. I garbled some of the oregano fresh and left some sprigs intact. I am going to dehydrate both variations and determine which process was easiest. Freshly garbled oregano and recently harvested oregano sprigs. The only herbs and vegetables I may not fully “wash” are those that I have tended to meticulously and that are grown far away from any non-natural influence. These may only get a slight rinse. However, when working with a city herb garden, there are all sorts of influences that require a good washing of your produce. You can wash the sprigs whole and/or wash them after picking the leaves. Washing the gabled oregano leaves. 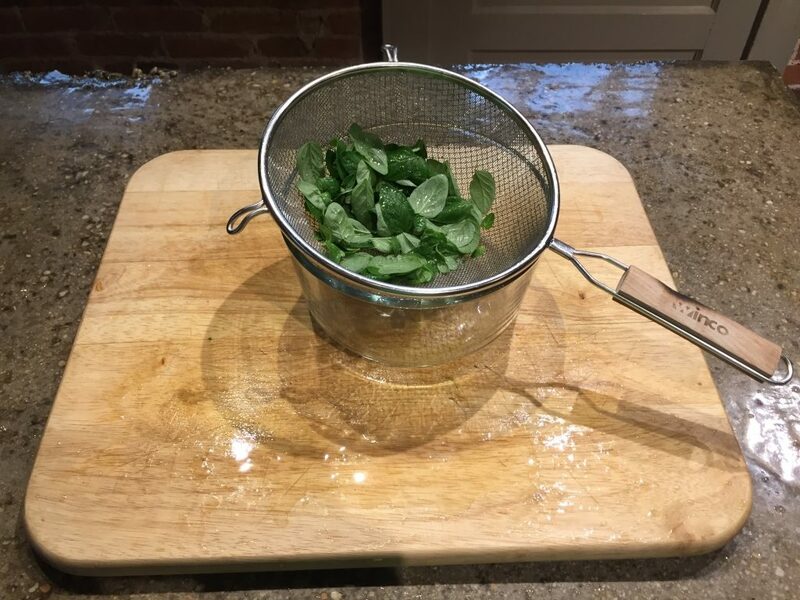 The easiest way to strain the leaves is using a fine mesh colander. 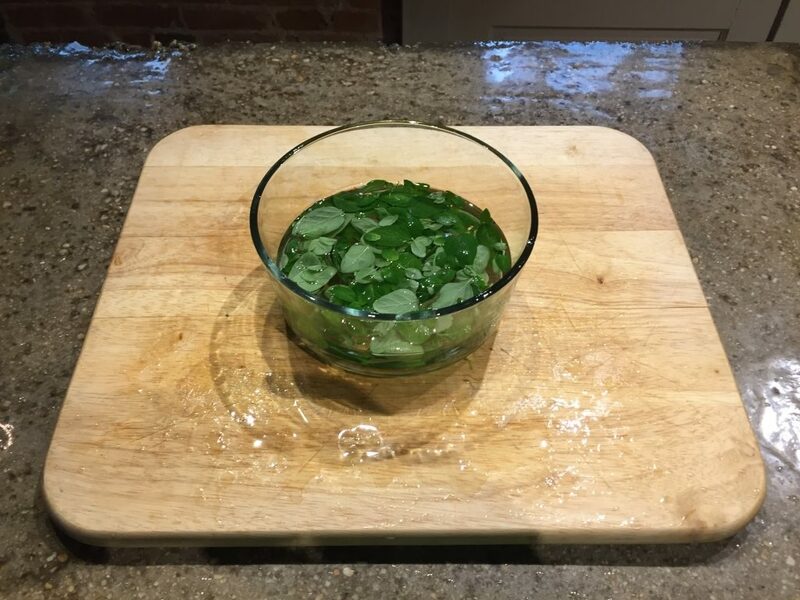 Mesh colander with oregano leaves. Sprigs of oregano washed and ready for the dehydrator. 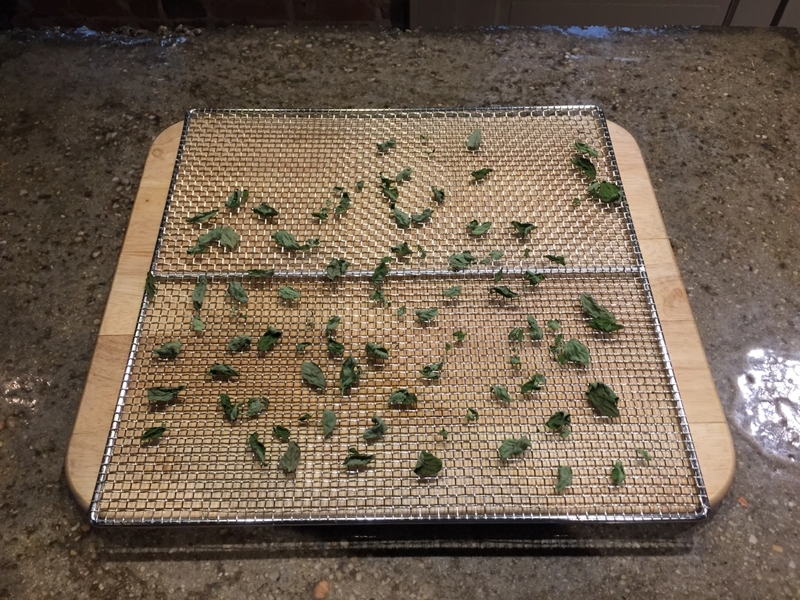 Garbled oregano leaves on a dehydrator tray. After testing the best way to prepare oregano for drying, there are a number of lessons learned. 1. Garbling dried oregano sprigs is technically easier. The leaves break away from the stems quite easily. 2. 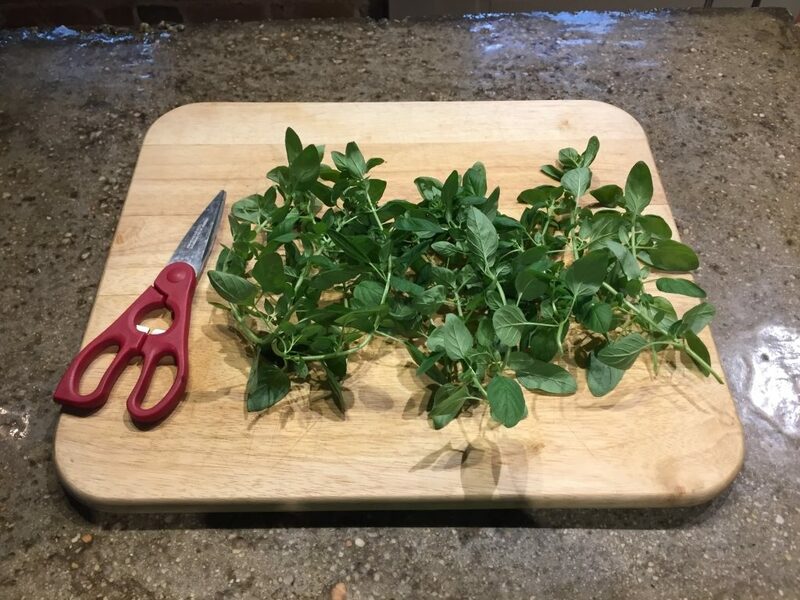 When picking fresh oregano, the process is a bit more time consuming but the end result is much easier to work with and more oregano is harvested. 3. The yield is lower when garbling dried oregano. When trying to avoid breaking pieces of stems into the mix, it is hard not to leave various bits of oregano on the dried sprig. 4. Garbling dried oregano splits with work effort into two distinct chunks. Garbling fresh oregano allows you to do the majority of the work in one sitting. Based upon this test, I am going to pick the leaves of fresh oregano and then dehydrate it. Drying the oregano on the sprig makes initial prep easier. However, it makes the final preparation of the dried oregano take longer. Also, its hard not to inadvertently leave bits of oregano on the dried sprigs. Picking only the best parts of the dried oregano, garbling, while fresh takes a bit longer initially. However, once dried, collecting the dried leaves is a snap. I searched Amazon for a potential tool to make this easier all around. Searching for “herb garbler” produces no results. Search for herb grinder and you find some interesting devices that I am sure Tommy Chong would approve. 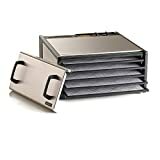 The truth is, the metal dehydrator racks of the excalibur food dehydrator work well to garble herbs. 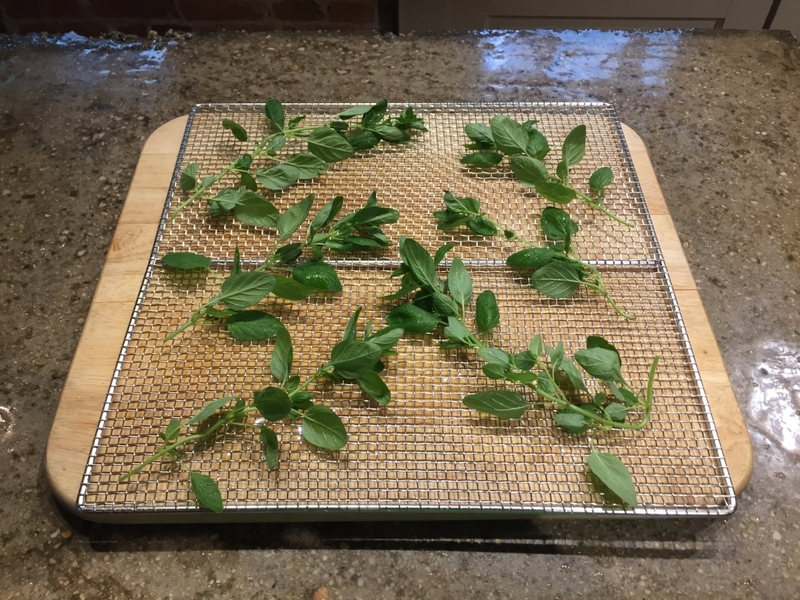 With a large dense batch of herbs, rolling the dried sprigs on the rack will separate the leaves from the stems quite well. Here are some interesting tools from Amazon. I’ve always used my hand to manually detach the leaves from the stems. Simply run your finger and thumb in the opposite direction of leaf growth. This works with flowers as well as any fairly hearty stemmed herb. Inspiring article. I’m looking forward to begin drying some herbs this summer!